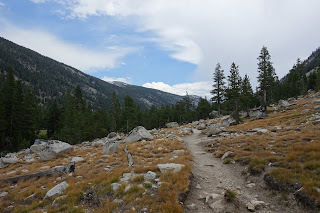 After our first taste of the trail in Yosemite, we headed East and then a few hundred miles South, to leave the car in Lone Pine, CA - the town at the base of the Whitney Portal trailhead access road. We grabbed a motel, which was insanely overpriced for this kind of town, and began to double-check our supplies. This was the real start for us, even though we had just spent 3 days on the trail... we would be going in for at least 20 days, so there could be no screw-ups on packing for this one! My pack weighed in at about 35lbs with water and a full bear barrel... not bad! It didn't feel amazing but it was a huge improvement over the heavier weights many other hikers were carrying. Throughout the trip I saw the majority of hikers carrying between 45 and 60 lbs, and that has got to hurt! 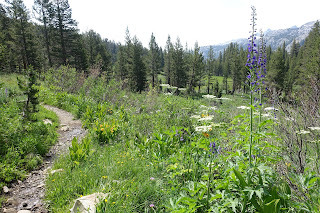 We grabbed the most expensive taxi of our lives to get us to the YARTS public transportation in Mammoth, which would eventually take us back through Yosemite - dropping us at our starting location for our permits... Tuolomne Meadows. 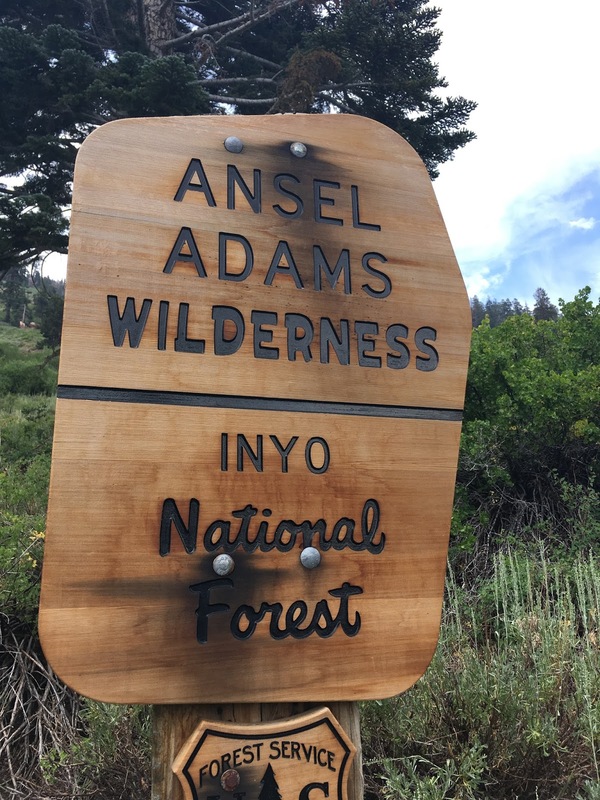 We drove by a fresh wildfire that had started the night before, and which now threatened our hike since it was on the opposite side of Lyell Canyon. I figured we'd try to move fast and get well ahead of it before it spread. 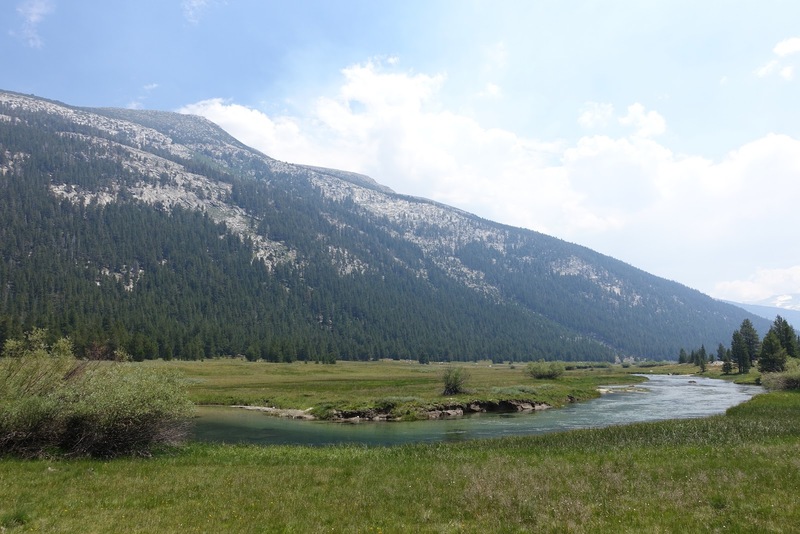 Heading off from Tuolomne Meadows, we hiked along a beautiful river for most of the day, and then began to ascend Lyell Canyon towards Donohue Pass. 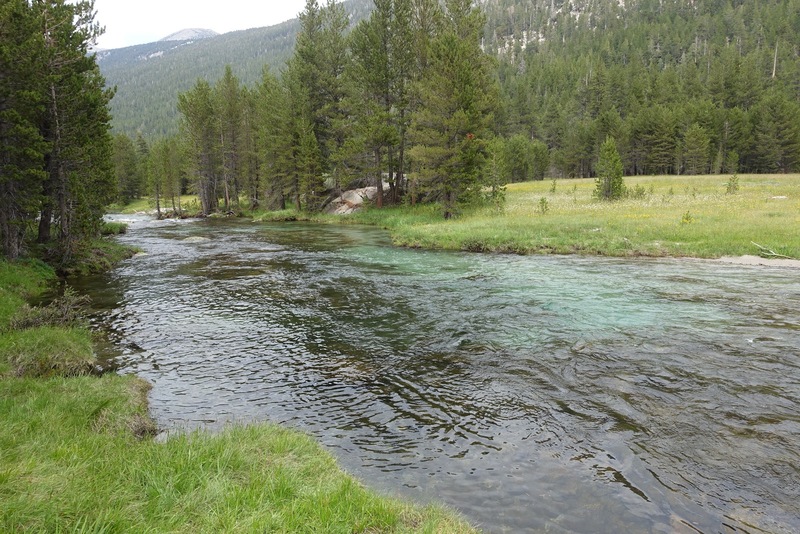 I stopped often to fish for the thousands of small brook trout inhabiting this section of river. 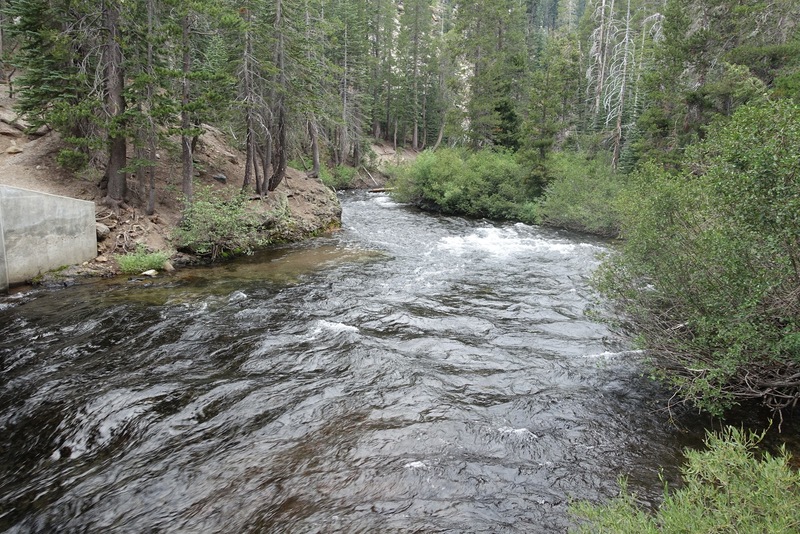 Did you know that the Western Sierra had no trout naturally until we introduced them? I want to read more about that because I don't know if the waters were actually barren, or if there used to be a healthy salmon population here before development and population growth wiped them out? Some additional research will surely be necessary for me on that. The terrain got steep as we began to climb the Canyon, and it is somewhere before this point that I lost Rob for the first time... and it surely wouldn't be the last. For some reason he was moving really fast, hadn't taken his usual breaks to fish, and maybe hand't even stopped for lunch. There was no other way to explain the fact that I hadn't caught up to him yet. We had planned to meet up near a specific campsite, but when I got there, he was nowhere to be seen. I asked around in the campsites closer to the trail if anyone had seen him, but nobody had any info for me. I figured he was still ahead and had decided to make it to the last campground before the pass, so I pushed on. Arriving at a beautiful bowl of mountains with a placid lake at their base, I still had not seen Rob. At this point it was too late for me to want to keep hiking, and it appeared we were about to have the first big water crossing of the trail. I knew from my experience was that crossing in the evening is rougher because the water that melted from the hottest part of the day would bring water levels up into the evening. The best time to cross is early in the morning when the colder night-time temps have re-frozen the snow, and slowed the melt-out. I set up my tent as two older gentlemen that I guessed were in their 70's showed up. We chatted for a bit and they too decided to wait out the crossing until the AM. Lights out! I left the door of my tent open as usual, and fell asleep looking out into the beautiful stars-scape above. They said they had heard him complaining about how I was so far behind and was moving too slow and never made it to camp or something like that... he was worried. They were super-entertained that I was now a few miles ahead of him. I was relieved to know where he was and decided to fish the outflow of the lake while I waited for him to arrive. Soon after that, Rob appeared seemingly out of nowhere with a group of some girls he had camped near, and I started to laugh about the situation. The other guys who had overheard him were also laughing, and they headed out ahead of us. Little did I know this would become a bit of a pattern for the hike. Everyone was in good spirits and I had already had some fun interactions with strangers on the trail. What a good start. We all crossed as a group, heading up towards the pass. Our new friends were a great addition to the experience, and we set out in good spirits, even if a few of us were still adjusting to our packs and our respective levels of energy. 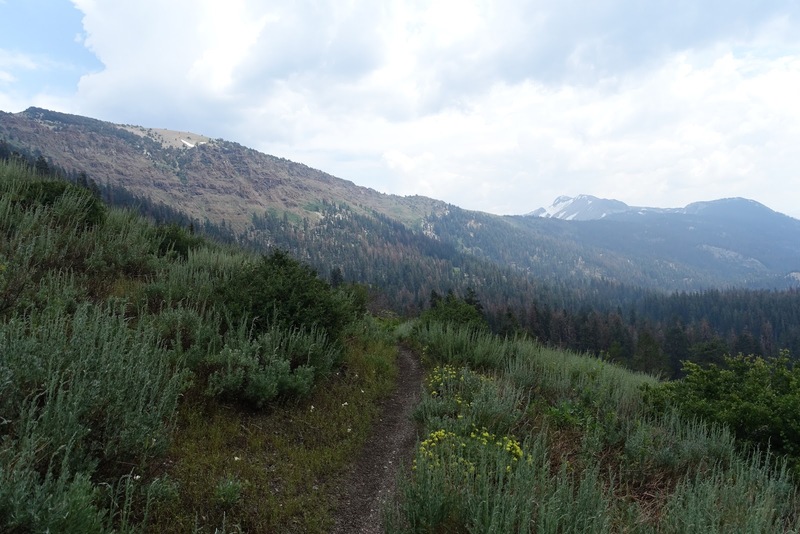 Donohue Pass was covered in snow, but it wasn't a bad hike at all. 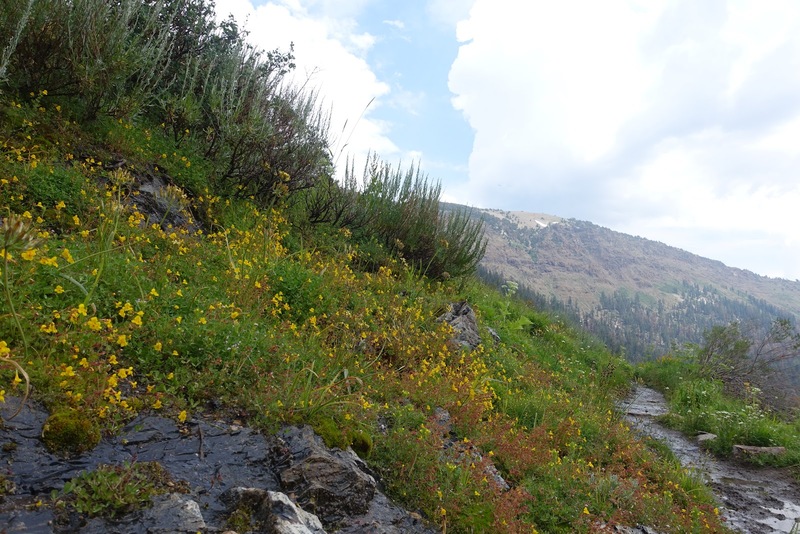 This was my first view of the sun-cups that form up high during melt-out, and I'd soon learn that these were quite small in comparison to others I'd see later on. Hikers coming through just a week or two before us had to walk on those sun-cups the whole time for miles on either side of the pass. Our timing was great. We mostly scaled straight up in existing footprints in the snow, and I used my micro-spikes for the first time on the trail. Glad I had brought them! The pass was beautiful, but we pushed on quickly to cover more ground. 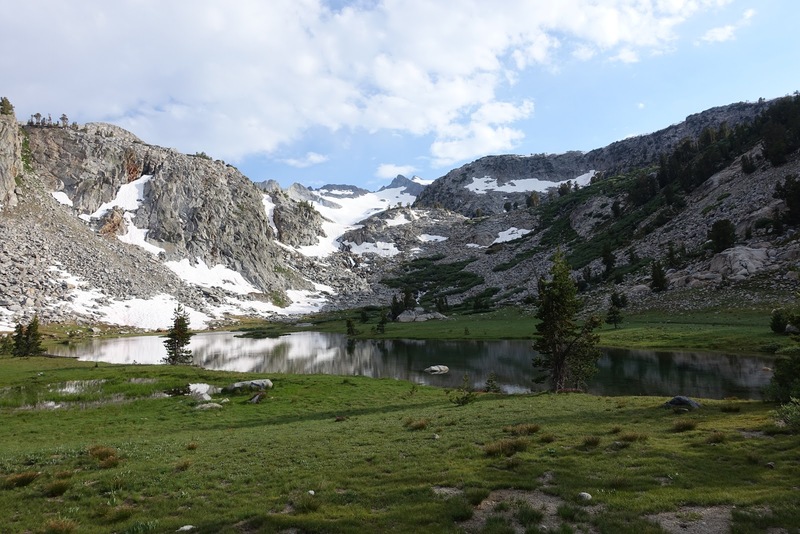 After descending Island Pass we arrived at Thousand Island Lake, where we had planned to camp for the evening. This was my first experience with a really crowded campground at high altitude - we shared a rather small flat area with our new friends Suzy, Amber and Rachel, and had a blast that evening soaking in the views and chatting each other up. I had not expected to be having such a great time with the trail culture. I knew I was interested in not doing my hike solo... my goal was not to immerse myself in the wilderness, alone, or I surely wouldn't have chosen this trail. However, I didn't realize just how great the on-trail culture would be, and I had under-estimated how much that would add to the experience. I was feeling really happy as the worries of mainstream societal living faded and were replaced by simple stresses like where to eat or when to eat, and the physical challenges associated with covering long miles and constantly changing altitude. I was also excited to be spending time with new people that had shared interests out in the wilderness. At the same time, I got my first ache which was a sore lower leg. I immediately got really scared about shin splints, and had my first major doubts of the hike. 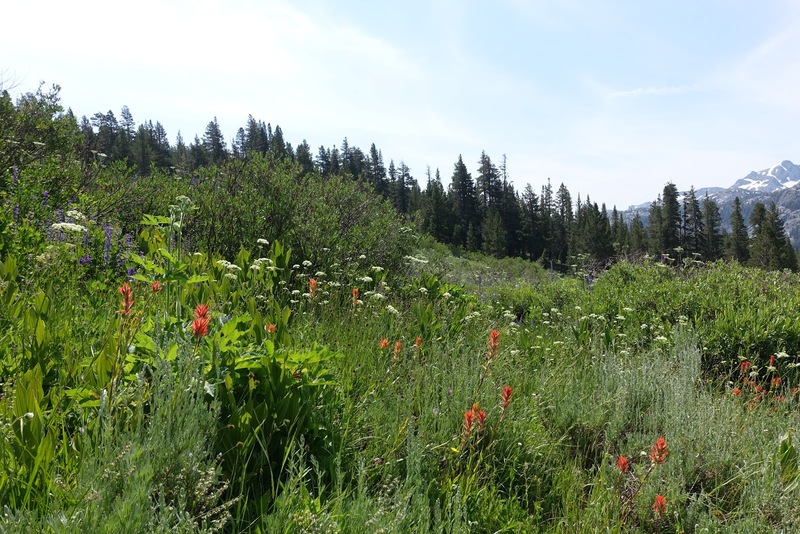 I knew I wouldn't give up mentally, but I was definitely concerned that my body would not be able to handle the increased mileage and constant strain of the pack. I did my best to massage my muscles, take breaks, and not move too fast. It worked and the pains faded the next day, as did my fears. 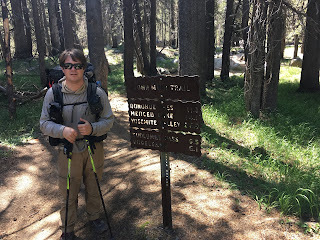 At this point we had to diverge from the JMT onto the PCT. 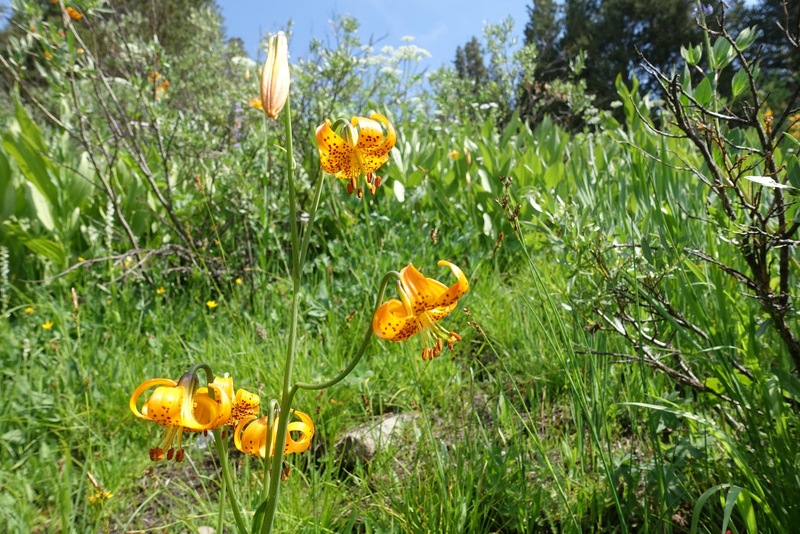 Our permits were for the PCT here, and we had hoped to log 500 miles when we had originally scored the permits. However, with the fires delaying our start, and with the need to get back to CO for an event, we didn't know how far we'd make it in the time allotted. 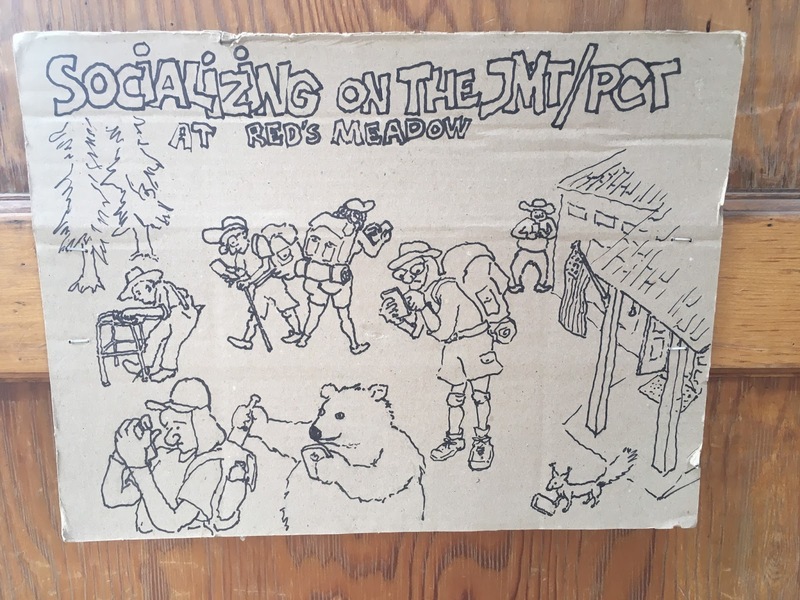 We said goodbye to our new friends and then headed off on the PCT, which parallels the JMT for around 13 miles. 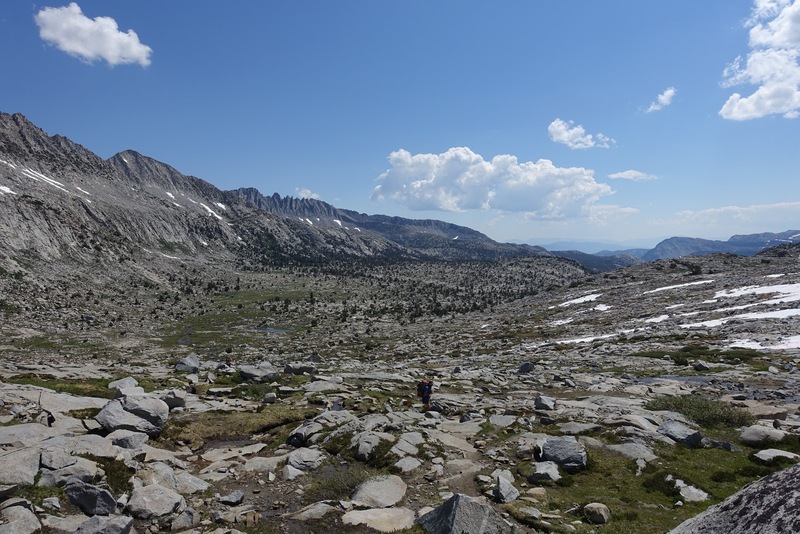 Basically we'd be diverging for one day, then re-joining the JMT near our first resupply at Red's Meadow campground. That section of PCT was really beautiful, as well as challenging in unexpected ways for me. 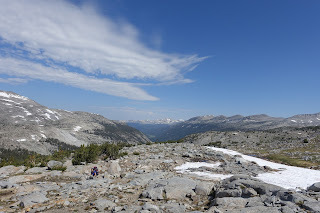 We had a long and gradual hike up along a ridge, and the snow had clearly melted much faster on this particular side than on the JMT side of the valley. 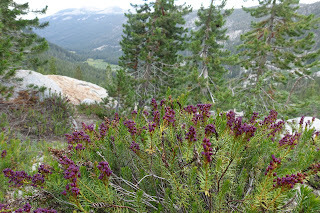 It felt dry and barren in some sections, but lush and green in others. There were fingers of flowing water entering a meadow that coated select portions of the mountainside we were hiking along, and because of all the water, the meadow appeared to be exploding with wildflowers all over the place. 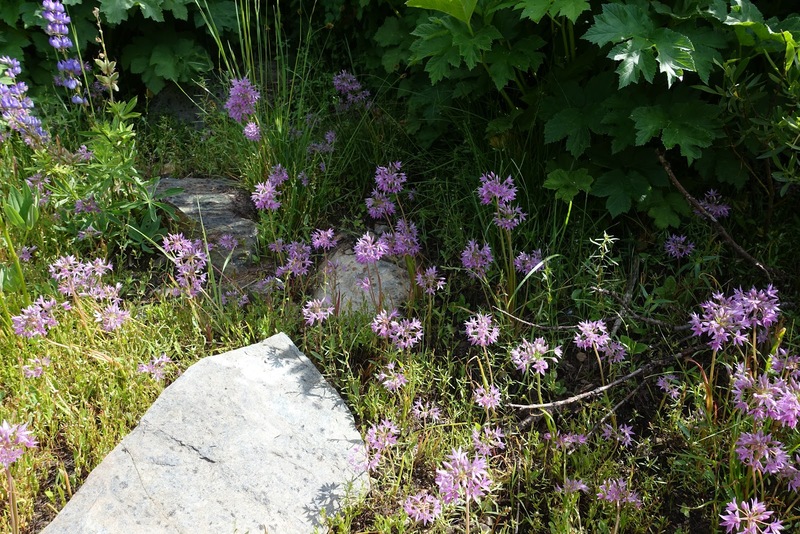 Between the sections of wildflowers were sections of newly-dry earth with sun-cracked patterns in the dirt. Growing among these sections were smaller flowers that created a purple hue all around. 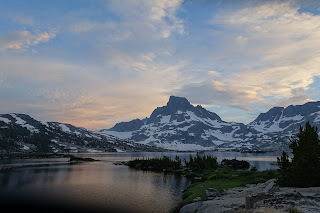 It was one of the most memorable mornings for me, and I enjoyed walking along this side of the mountain while looking over to the other side, where the JMT and our friends were hiking parallel to us. I could tell from the raging waterfalls that they'd be doing more difficult water crossings than we had done on this section. We also had better weather, as the thunder-showers mostly stuck to their side of the valley during the day. Lucky for us! 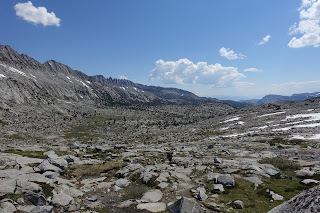 As the afternoon sun hit, we began to descend, and we were in a hotter and drier terrain than we had seen in Yosemite. 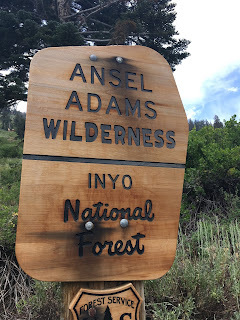 We had entered the Ansel Adams wilderness earlier, and we could tell there were significant differences between it and Yosemite. At this point, the thundershowers began to spread, and threatened our side of the valley. 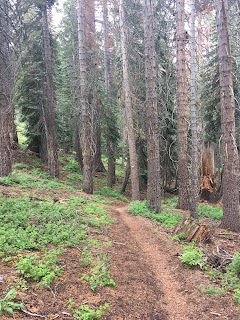 I began to move really fast off the ridge and welcomed the continued descent into more protected and forested land below. 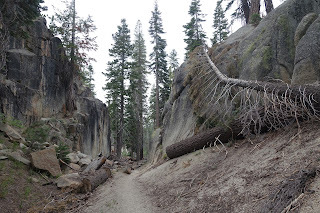 As I entered a new kind of forest for me on the trail so far, it began to rain. I sheltered under some trees and took a much needed snack break. The evergreen trees do a great job of shielding you from the rain, and I knew I could rely on any bunch of trees to get the job done. If needed, I could always use my trekking umbrella, but the rain usually only lasted a few moments at a time... rarely enough to need it. 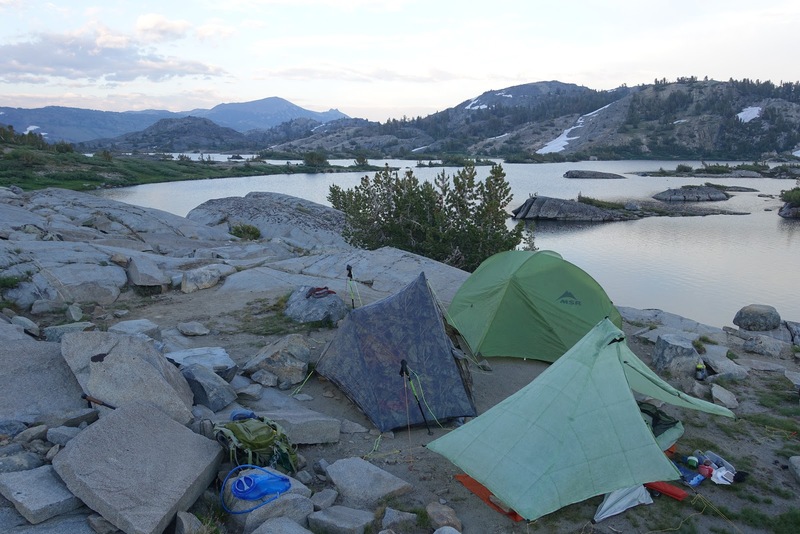 That night Rob and I camped away from other people and in a nice rustic spot near a river. 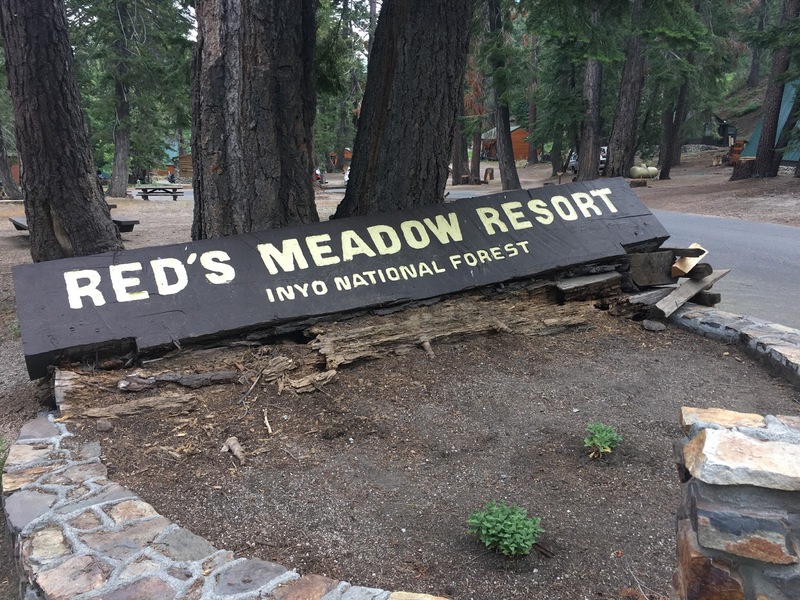 It was a really solid site and I felt good knowing that the following day we'd be arriving at Red's meadow for a real meal and a resupply of 7 more days of food. I slept well and got a full night's sleep that evening. In the morning we took our time, did some fishing, and then headed out. 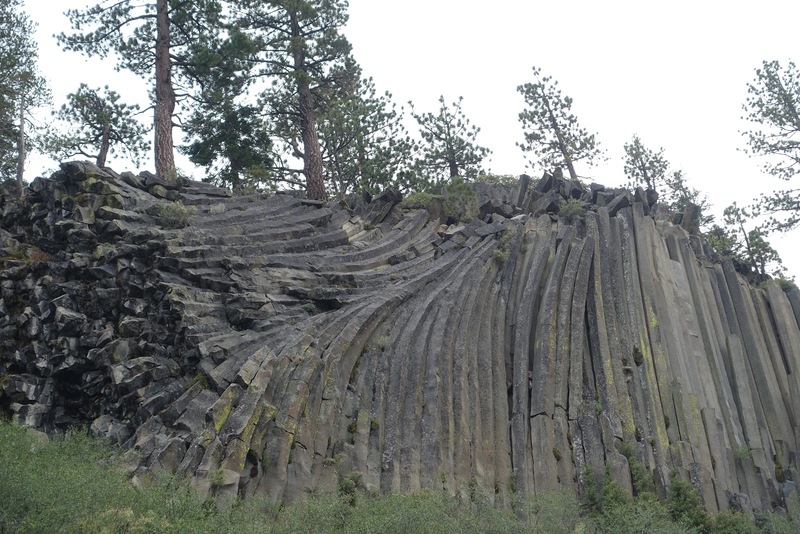 Rob wanted to go straight on to Red's meadow but I wanted to go visit the Devil's Postpile National monument. I took a nice 3 mile detour that was longer than it needed to be to check it out, and grabbed a few photos. The monument was crowded, ad this was my first time in a few days seeing that many people in one place, so I didn't linger too long. People smelled different to me now... I could smell their perfumes, their sunblock or their lip gloss down the trail before I could even see them. I knew who was there to mosey around for a day and who was there to really hike just by my nose alone. The crazy formations were created by gas being emitted in a unique pattern during a lava-cooling event, ages ago. Nature is really cool sometimes, and this was one of those moments where that hit me really hard. After taking in the monument I pushed into a fast paced half-jog, half-walk to get to Red's meadow to make sure I'd get a hot meal and a shower. 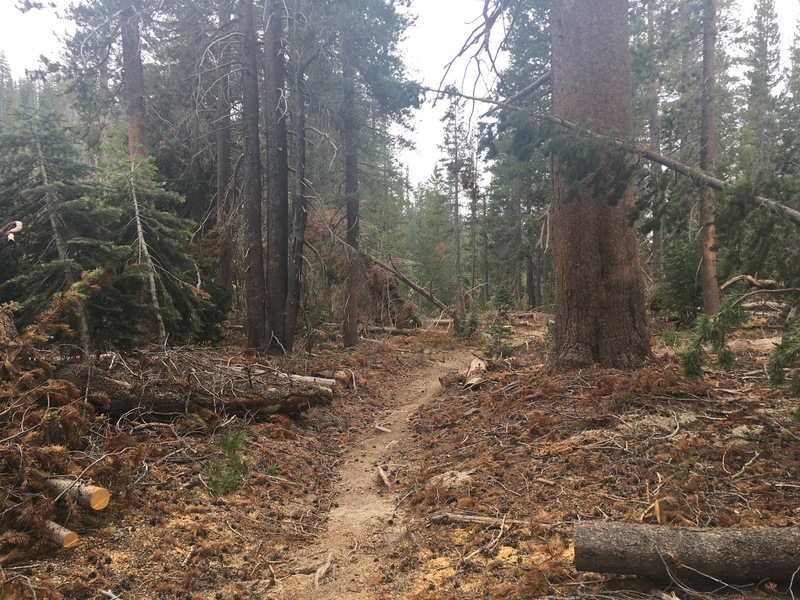 Those last few miles went fast - they showcased the power of the record melt-out of 2017 with a display of chaotic debris scattered about, and clear evidence of erosion all over the forest. 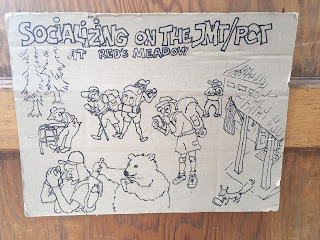 Soon I was at the junction with Red's Meadow and I couldn't have been happier. Once there I reunited with Rob and our new friends, ate an incredible-tasting yet simple grilled cheese with bacon and tomato, a chocolate shake, and took a shower. Laundry was a social experience, and I laughed as Rob put his clothes right into the dryer instead of the washer, realizing later what had happened. Good times were had by all. Some weather moved in and many of us set up camp nearby. Rob had decided he wanted to push ahead to meet up with one of the friends he had made on the trail. I made some new friends at the campground, and had a great time getting to know them that evening. 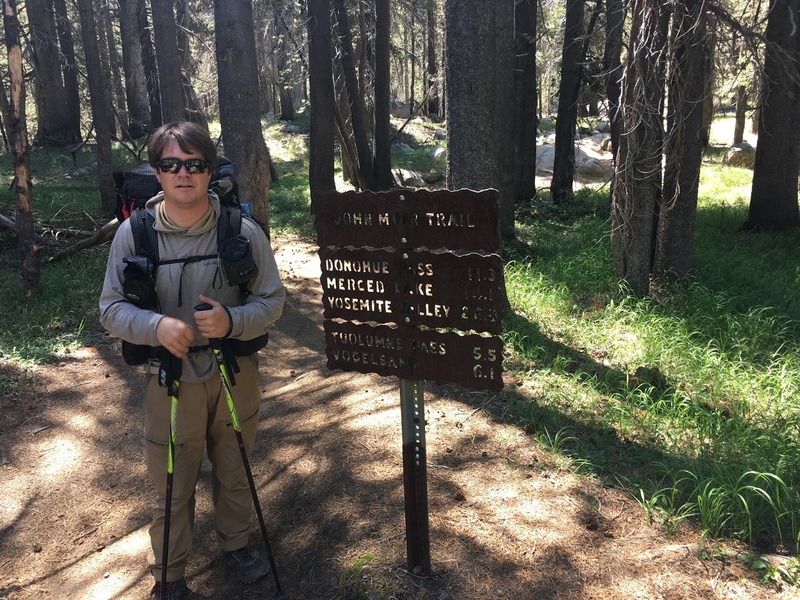 This part of the summer's adventures began in Yosemite - an iconic, over-crowded wonder of nature that draws tons of people who may or may not be able to comprehend or take advantage of what they are experiencing while there. Rob and I arrived during a massive wildfire that had, just 2 days before, coated the entire valley in smoke and created a heck of a lot of confusion about how we were going to begin our hike as planned. This ended up being helpful in the end, as we were able to do some things we may not have been able to do otherwise. You see, the John Muir Trail requires permits, since it is just about the most scenic through-hike in the USA - depending on who you ask. We had not secured JMT permits, but we had secured PCT 500 mile permits for the Pacific Crest Trail, and we planned to hike the overlapping sections of PCT and JMT, and possibly beyond, if our schedule allowed. Given that this raging fire nearby had scared the majority of tourists away, we waltzed right in, and scored one of the most in-demand permits in the park, to hike the northbound JMT between Tuolomne Meadows and Happy Isles; which would take 3 days - before starting our PCT 500 southbound back at Tuolomne meadows, and going straight on to the Southern High Sierra from there. We spent a night in a car-camping site, and then set off the next day from Tuolomne Meadows, heading northbound on the JMT... which was, confusingly, actually taking us due South. Go figure. It was a monumentally exciting moment for me. I somehow felt that almost everything in my life had been leading up to this very moment... and all along while making these plans, I had presumed we wouldn't be able to get these permits, that the snow and melt out would keep us out, that a fire would get in our way... yet here we were! 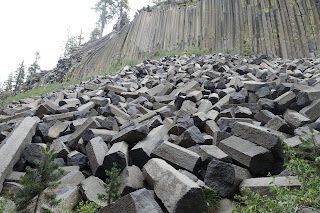 Almost immediately we were hiking through easily-recognizable features that were decidedly "Yosemite" in appearance. It was hard to believe that the moment had arrived. I felt overwhelmed... excited that things had gone as planned, excited about what lay ahead... but also apprehensive. 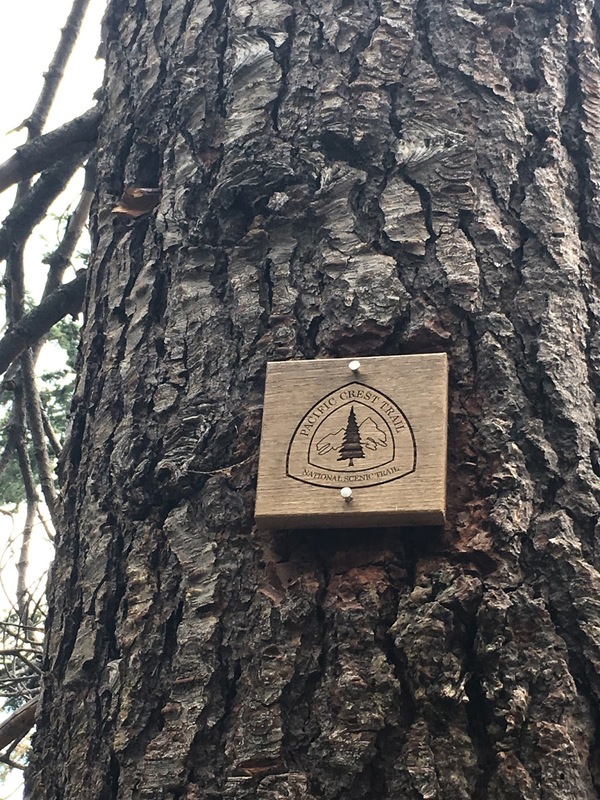 I wondered to myself, would I be able to complete the trail? Do I have what it takes? 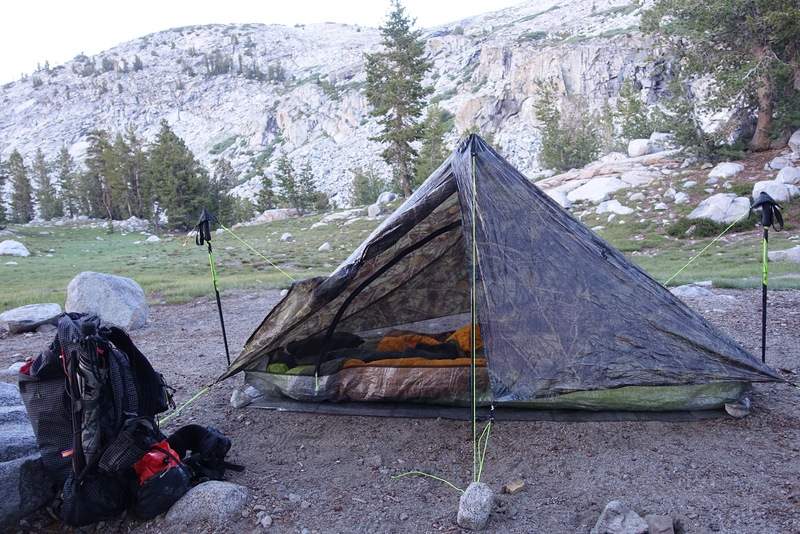 Does a lifetime of backpacking short trips add up to the skill required to pull this off? Did I train hard enough and prepare well enough to finish the John Muir Trail and more? 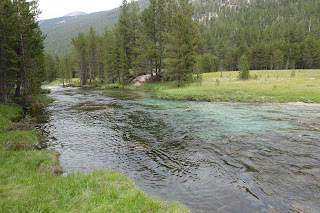 Soon those thoughts faded though, and I was focused on the scenery, my breathing, the mosquitos, and wondering where we would get a chance to catch our first trout on the trail. Did I mention it was hot? California is HOT. They always say "oh, its just dry heat, its not even that hot." THAT IS A LIE. Speaking of which, I cannot tell you how many things I heard about California that ended up being lies. Let's start with the "golden hills" thing... what... you mean the burned and dead brown hills? Sure. Don't get me wrong, I love California. But I think everyone has sold California as a bit of a lie to everyone else, just to get them to go there. No different today really, is it? California would benefit from just a little less heat, of that I am sure. 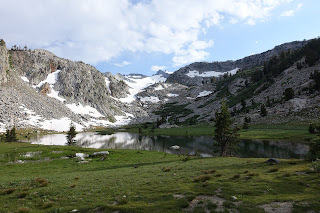 As we hiked towards our first pass, Cathedral Pass, we hit some pretty serious mosquitos and got our first taste of what was to come. Luckily I had worn my bug-stopper hoody and treated the rest of my clothes with Permethrin. This, along with a bug head-net essentially gave me full-body armor and I was not having a bad time with bugs whatsoever. Score! As we hiked, the views just got better and better. I took too many photos, but it was also always good to have an excuse to stop and take a deep breath. We soon discovered that the meadows held the worst mosquitos, and the whole area had just melted out... meaning they were hatching in full force. We encountered a group of college-age girls who were running at top speed; jumping, hollering, hooting and making a racket, they raced past us screaming about mosquitos and slapping their exposed skin repeatedly. Rob and I laughed, picking up the pace and hoping we wouldn't be hit as hard. Taking a cue from the girls, and a tip from another hiker, we made plans to camp up higher near the pass itself, hopefully giving us some shelter from the swarms of hungry mosquitos. This tactic ended up working mostly as intended, and we set up camp without nearly as many bugs around as we had hiked through down below. 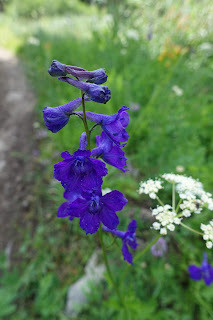 Another astonishing thing for me was the variety and overall quantity of beautiful flowers in every shape, size and color. The melting snow had created a booming year for all sources of life, but especially for the flowers. After setting up camp, it was time to go enjoy the views. Behind the ridge we were camped on was one of the most epic sunset views I had ever encountered, so we soaked in the experience as thoroughly as possible. As I looked out into the mountains, I felt conflicting feelings of calm and chaos... on one side, there was the excitement of the adventure at hand. On the other, there was the gravity of the task at hand. I decided not to worry on this trip, and take it as it came... which was not an attitude that had really worked for me back in city life. That ended up being a good thing. The light in these mountains is almost beyond words, and certainly beyond my amateur abilities as a hobby photographer with a less-than stellar camera to capture perfectly. 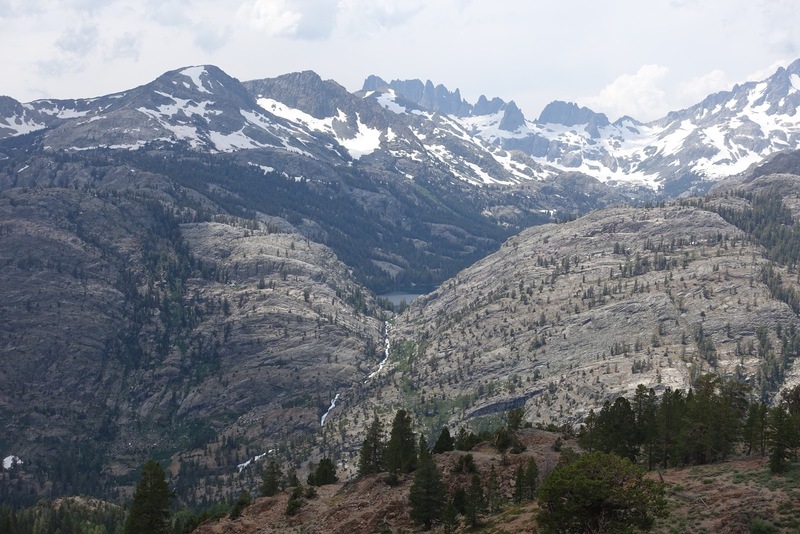 I began to understand why Ansel Adams had chosen this mountain range as the subject of much of his life's work. It truly was magnificent. I slept reasonably well on that first night, and woke up to a beautiful morning, albeit full of mosquitos and a totally botched breakfast. But I soon recovered from the mediocre beginning of my day, and the surroundings re-set my mood in no time at all. 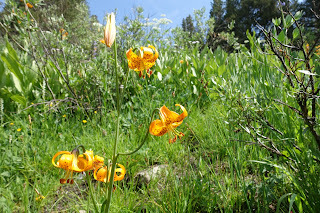 Again on day 2, I spent way too much time taking photos of flowers and other beautiful things I never wanted to forget. Some of the most unique and picturesque terrain was probably the burn areas left over from the infamous "Rim Fire" from just a few years back. A decent amount of the park burned, leaving fields of tall, blackened trees, which in turn created a severe lack of shade in the hot summer sun. I reminded myself again that the hot summer sun was going to melt the snow, and therefore I should try not to be too mad at the heat. I also knew that this was a notoriously hot section of trail... and just the fact that we weren't hiking through clouds of smoke from the nearby forest fire kept me from being too bothered by anything negative at all. 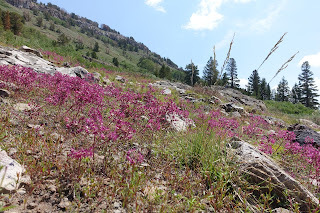 I found it difficult to photograph the flowers and the burned trees... which was disappointing because it made for some beautiful scenery. The scale of the trees being so large, while the flowers were so small definitely didn't make it easy. 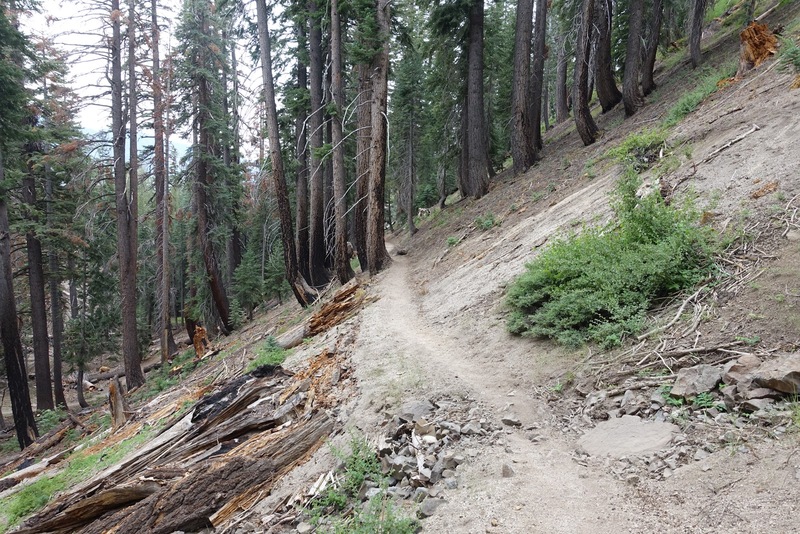 Somehow though, this burned section was immediately one of my favorite sections of the hike so far. It just left me with a kind of feeling that is hard to describe - one that had a long-lasting and memorable impact. 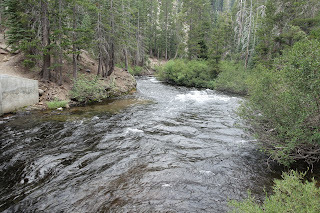 After descending a few more miles, we arrived at the Merced River and the backpacker's campsite. We set up camp and I went fishing, where I met a group of people, a couple of whom had just bought some cheap "tenkara rods" online. I spent some time teaching them how to use the rods, and we all caught some fish. While I was off fishing, Rob watched a rattle snake try to get into my tent, and he scared it off by tossing pebbles at it. The Japanese couple camped near us were rather intrigued by this apparently, and I wish that I had been there to see it all go down. 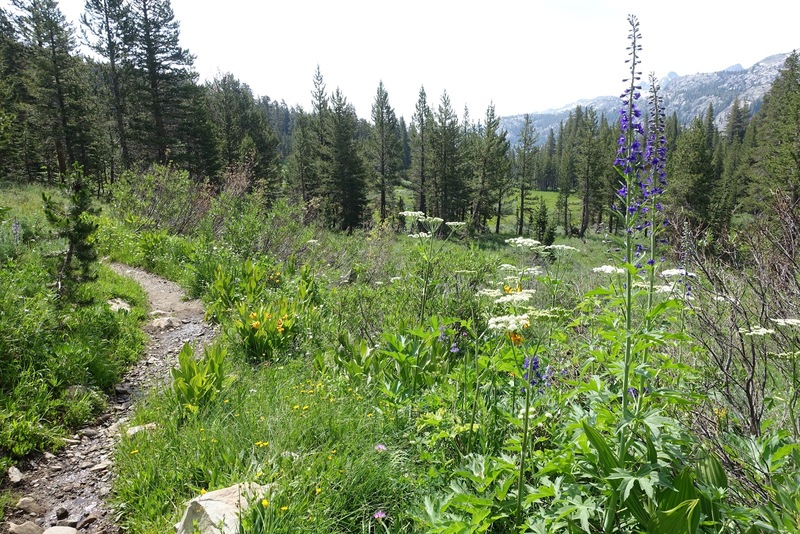 The next morning I said goodbye to my new friends, hoping that we'd meet up again along the trail when Rob and I looped back around to start hiking again from Tuolomne Meadows, heading Southbound. 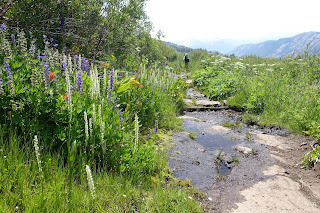 We set off towards Happy Isles, knowing we needed to arrive well before the only shuttle bus that could take us back to the car at the trailhead. 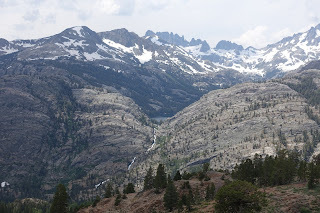 We hiked across and along Nevada falls, looking back at views of Half Dome and other features I don't know the names of. The waterfall was absolutely raging and the sound carried for miles. I'll never forget this view looking back at the falls from farther down the trail. Another mile or so down the trail we hit the crowds, which felt strange after being on the trail for a few days. Hundreds of tourists were marching along paved "paths" towards the base of Nevada Falls... but most of them would never make it. I reflected on the complainers and whiners, the people in flip-flops or jeans toting over-stuffed purses and clutching cameras in the mid-day sun. I quickened my pace, slamming my hiking poles on the concrete to make noise and hoping that people would move out of the way for the hikers who were actually in good enough shape to cover more than a quarter of a mile before giving up. Soon we arrived at the Happy Isles Bridge, knowing we had completed the first section of our through hike. We ate too much food in Yosemite Valley, and then made the shuttle with time to spare. There were also no problems with grabbing our food and other stuff that we had left in the bear-boxes near the car, so we drove off to find a campsite for the night. Luck was on our side for now, and we ended up finding one of the most picturesque car-camping sites of the trip - which, coincidentally, had just opened for the season that very morning. I slept really well that night, feeling accomplished and excited about what was to come in the following weeks on the trail... more on that soon!